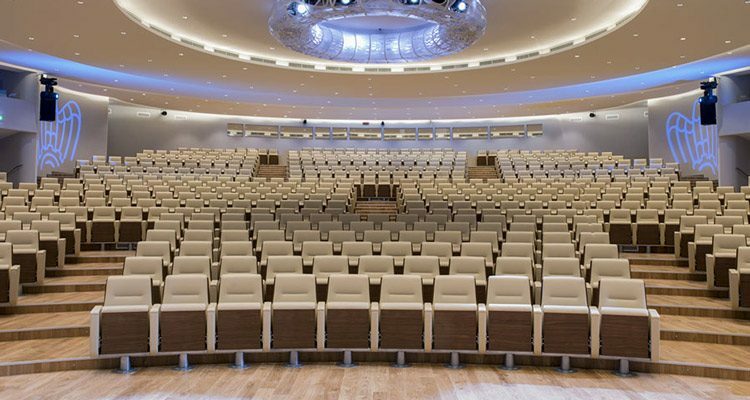 The Auditorium della Tecnica, located in the headquarters of Confindustria, is an innovative arena specifically tailored for the most important economic and cultural events. Situated in the EUR neighbourhood, surrounded by its own typical landscape, the Auditorium della Tecnica offers beautiful aesthetics, modern technology and great comfort. The Palazzo della Confindustria is a perfect venue to promote Italian-Arab economic relations, as it fully expresses the role of the Italian economy in the world. JIACC has arranged different agreements with hotels and restaurants in the EUR neighbourhood, in the areas near Termini Station and in other central areas of Rome. Below you will find a list* of partner hotels, partner restaurants and partners NCC (private car transports). *The lists will be updated in the coming weeks as new agreements will be signed. by train: take the Leonardo Express train to Termini Railway Station (32 minutes). To reach Eur from there, please follow “By Train” directions. by car: drive on Via Appia Nuova towards Rome for 2 km. Then turn right on the Grande Raccordo Anulare towards Florence; after almost 10 km take exit number 26 to EUR Rome. From there, please follow “By Car” directions. by bus: take the shuttle bus going to Termini Railway Station. From there, please follow “By Train” directions. There are two big Railway Stations in Rome: Termini is served by underground B and B1. Tiburtina, by the underground B. Once you are in on of the two stations, please take the underground B or B1 to Laurentina and get off at Eur Magliana. Walk 650 m to Viale dell’Astronomia, 30. Take exit number 26 from the Grande Raccordo Anulare – to Eur Rome and continue towards Via Pontina and Via Cristoforo Colombo for 2.5 km. Once you are in Piazzale dello Sport, turn right to Piazzale Pier Luigi Nervi/Viale dell’Umanesimo. Continue to Largo del Ciclismo then turn right into Viale dell’Umanesimo/Largo Mustafa Kemal Ataturk; turn right again into Viale Umberto Tupini/Piazza Ghandi and, finally, turn right into Viale dell’Astronomia (1.7 km).